Product #46644 | SKU 14940 | 0.0 (no ratings yet) Thanks for your rating! For Use with German / English Tubas, Supported Width - 10.8 to 17.9"
The K&M 14940 Tuba Stand (Black) is an ideal solution for German and English tuba support and accommodates instruments with widths from 10.8 to 17.9" (275 to 455 mm). 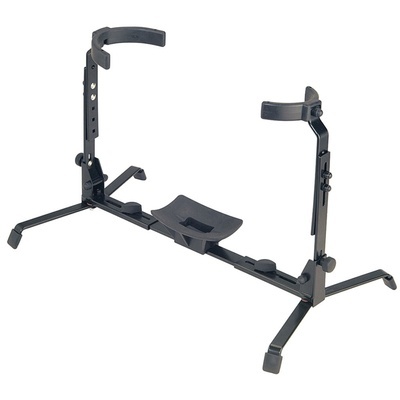 With fully-adjustable supporting arms, the stand provides height adjustments from 12.2 to 16.3" (310 to 455 mm). A non-marring plastic coat on the stand offers protection to the instrument body from scratches. Also integrated into the stand is a big bottom instrument support coated with non-marring plastic that protects instruments from damage. An additional notch is also provided for supporting instruments with a ridge. The tuba stand is made from steel and sports a black colour.